A supplement to the Lingoblog-article The language of The Julekalender by Mickey Blake, the original writer of the background study for the article. How the time flies! It seems almost impossible that it’s been over twelve years since I visited Carsten Knudsen at his home in Risskov to obtain a copy of the script from “The Julekalender” and ask him about the creation of “N​isseEngelsk​”. Little did I know that day how much work I was setting myself up for! Peter Bakker had been hoping for years that some brave student with no clue as to what they were getting themselves into would write a description of the fictitious language, and he found his patsy – er, star student – in me. I had already developed an interest in mixed languages when I took his class on pidgins and creoles, and if my memory is correct, this term paper served not only as a “​double paper” for Language Description, but also as a delayed term paper for that class. For all that Peter was my favorite professor during my time at Aarhus University, and for the most part I liked and admired him greatly, I think I hated him just a little by the time I finished this project! In preparing to write this blog post, I revisited my old ​magnum opus​ and skimmed through it. At sixty pages long, plus appendices that include the full corpus, the blasted thing is longer than my ​speciale​: almost 130 pages all in all! (Should you feel adventurous, you are welcome to e-mail red@lingoblog.dk to get the pdf, red.) By the time I submitted it for grading, I was well and thoroughly sick of Hansi, Gynter, and Frits, and in truth, I have not looked at it again in the intervening decade. Like anyone who struggles with perfectionism, I was immediately reminded of its flaws due to the various holes in my linguistics education at the time, but in retrospect, I admit I am rather impressed with the sheer scale of the thing, and the amazing amount of work I accomplished in creating it. Preparation of the corpus was an enormous operation, as my photocopy of the original script had to be scanned and then run through optical character recognition (OCR), then proofread for errors both belonging to the original manuscript as well as those introduced by the imperfect OCR process (I seem to recall that my OCR software choked a bit on æ, å, and ø). Multiply this by 8-12 pages of script per episode times 24 episodes, plus the text from the songs, and you may get an idea of just how much effort corpus preparation alone required! The word “slog” springs immediately to mind, even at this remove. Examining the corpus in detail and analyzing its syntactical, morphological, and phonetic features was another tremendous undertaking. The NisseEngelsk corpus, while large in terms of an appendix to a term paper, is nevertheless quite small as linguistic corpora go. It was frequently difficult to draw out multiple supporting examples of any putative linguistic features I was attempting to describe, though my graders were understanding of the limitations I was working within, and did not penalize me for the paucity of my corpus. In addition to documenting its linguistic features, I also analyzed them in the context of mixed languages and bilingual code-switching. This analysis allowed me to conclude, unsurprisingly, that NisseEngelsk represented neither a natural mixed language, nor the kind of code-switching common to bilingual speakers. However, as I spent the first seven chapters of my paper with tongue firmly planted in cheek, assiduously pretending that I was describing a natural language, I asserted in context that it was a “typologically novel mixed language, both in terms of sociolinguistic typology and in terms of traditional typology”. 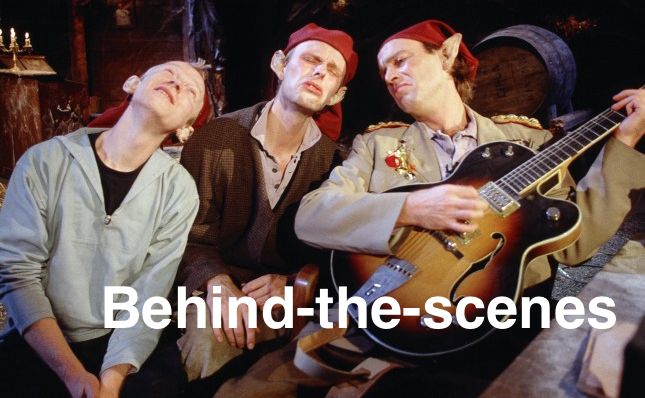 As the members of De Nattergale (the aforementioned Knudsen, along with Viggo Sommer and Uffe Rørbæk Madsen) are comedians and musicians, not linguists or even practiced conlang creators, it stands to reason that their creation would lack the internal consistency and structure that arises in natural mixed languages and bilingual code-switching situations. I did and do commend their sheer linguistic creativity, doubly impressive for the fact that it incorporated a language which none of them spoke natively. Particularly noteworthy were inventions I dubbed “phonological loan translations”, such as “spoons” to mean “woodshavings” (cf. Danish “spåner”) and “tree” to mean “wood” (the material, not a forest; cf. 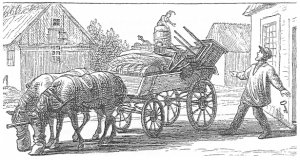 Danish “træ”). I confess, it was great fun to write about ​nisser​ as if they were real beings, in the vein of one of my primary reference works, “​Nissens naturhistorie​” by Aarhus University’s own J.G. Larsen. 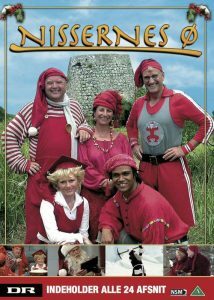 I even discussed a putative “​nisse​ diaspora”, playing on the Danish saying“ ​nissen flytter med”​ (the​ nisse​ moves along with you),and citing as support the resident ​nisse​ of the Virgin Islands from “N​issernes Ø”​ , another Danish Christmas serial. 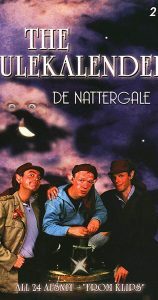 Since the moment I turned in my paper, Peter Bakker has repeatedly urged me to revise it and seek a publisher to put it out in book form, ideally in a Christmas season where “The Julekalender” is being re-aired on Danish television. I won’t say that I had to leave the country to get him to stop, but since moving to to Munich in 2010 I am out of sight and, thankfully, out of mind, so his exhortations have ceased. I fear this article may re-initialize his mentorly encouragement, so I will preemptively quash his efforts by stating that I am VERY BUSY starting my own language teaching business right now. Should anyone reading this post wish to overhaul the weaker areas of my work, however, I am not at all averse to the idea of co-authorship! 2003: The Nisser went to the Virgin Islands. Saint Croix. I am, in hindsight, quite satisfied with my chapters on the morphology and lexicon of N​isseEngelsk,​ as well as my analysis comparing its structure to both mixed languages and code-switching. Its most significant weaknesses were in the analysis of its syntax and its phonology. I would certainly love to see a native Danish speaker with a better understanding than I have of Danish phonetics, phonology, and dialectology tackle the sound system of NisseEngelsk, as my treatment of it was superficial and riddled with errors. My grasp of formal syntax models was and is minimal, so a more rigorous analysis of the syntax of N​isseEngelsk​ could also be a fun and challenging term paper topic for some future student. The corpus is present in full in the PDF, and I would be happy to release it for future use under a creative commons license. One might wonder, reading the sociohistorical chapter of my term paper, “Does this person really believe in ​nisser?​ ” To which I would respond, “Every bit as much as I believe in Santa Claus: with all my heart for the duration of the Advent season, and not at all for the rest of the year,” which is not a bad little portion of belief for an atheist. I wish everyone reading this blog post at the time of its publication a happy and healthy holiday season, and a joyful and prosperous new year. This project has now taken up over three-quarters of a year of my life. Although I’m getting a little tired of ​NisseEngelsk​, I feel that, in submitting this description and analysis, I am treating it like art — never finished, merely forsaken. Indeed, every time I made a pass through my corpus to analyze one feature, I found several more. I am certain that any linguist reading through my paper and its appendices will find many more points to analyze which I missed completely. Naturally, I would be thrilled to hear about other features to analyze, especially if someone else does the analysis instead of me. det ville bår være dejli’! Margaret Blake is a chemist, linguist and language teacher living in Munich, Germany.